In a former life, I worked in the adult Serious and Persistent Mental Health/Substance Abuse field. I was completely comfortable with 52-year-old men who struggled with Schizophrenia, flipping over tables at me during psychotic episodes…I was. I understood that. I could deal with that. I then began working with children ages 5 and up who had these similar issues. But Autism? I knew very little….I would learn as I went through the process. Keep an eye out for those key moments that I can apply to my current work as an early interventionist. Later that day, I was on the phone with my mother, recounting the story, and said, “Oh God, I hope Michael doesn’t have Autism,” as I rubbed my belly. She snapped at me, “Why would you say that?! He’s not going to have Autism, Christine!” But I knew…without knowing all I know now…I knew due to family history that there was a risk. I knew that it was 1 in 150 at the time….I knew he might….but I did not have a clue what to do with him if he did. Fast forward 2+ years, and lots of evaluations, later!!!! Nobody wanted to say the “A” word…but I knew…he had multiple Psych Evaluations, OT, SLP, Audiology (3 times), Neurology, EEG’s, PE Tubes….. you name it….SO I quit my job, stayed home and was COACHED. We didn’t call it that back then, but that is what it was! I was taught what to do… I asked questions, and therapists answered them. There were some therapy sessions where I just sat back and watched…and those were useless for me. When I was up and engaged and interacting, I learned more, and more importantly…HE LEARNED MORE. I would ask my providers all the time…”Do you think he has Autism?” I got mostly a bunch of… “Michael, no!” (Perhaps they were sparing my feelings, but that would have done no good at all.) The relationship between parents and their providers is crucial. If we ask a tough question like that, gently tell us the truth. Coach us and teach us and point us in the right direction for the answers we are seeking. Again, just be gentle. In fact, when a school system representative came out to the house for our Transition Planning Conference, Michael came over to me and said, “I want a cookie, Mommy. Please get up.” (There goes a classroom placement) On his first day of Early Intervention Family Counseling (i.e. Infant Mental Health – IMH) services, he came over to the table where myself, his SC, and the new therapist were sitting, made perfect eye contact with each of us, and said…”Let’s go play.” He pulled each of us into the living room with him….this was where most of the therapy happened. And looking back….that was a huge mistake….the sessions that happened outside of the living room were much more meaningful and clued me in to how he functions in the real world, not in the living room. I look back and think that I lulled myself into a false sense of how well he was doing by keeping intervention services skills-based and in the living room. The truth is, not much “living” happened in my living room. I am sitting in it right now. It has a giant television and every couch and chair is angled to watch the thing. So, the purpose and function of this room is to watch TV!!?!?! Well, he could do that and recite it, too! Here is the thing about coaching – as a parent you have to humble yourself. You have to get to a place where you realize, you don’t know as much as you think you do. And you have to be open and willing to admit this to yourself and learn. IF a parent can get to that place, as a provider…you are in! You are good! You will be able to support the parent and empower them more than you ever dreamed because they will carry it with them for years. My most memorable early intervention sessions were not on the floor of the living room. They were in the bathroom during a potty meltdown with our IMH counselor, and in the kitchen with our OT during a feeding session. I had no clue we could do something like go to Harris Teeter…see, this is where the problems were really bad, not at home. The playground was a mess….he would run off, play by the fence, and not follow directions. If we had support there, the intervention would have been so much more meaningful. I would have understood him to be much more severely in the grips of Autism then he seemed at home. I understood my son well by the end of my early intervention experience, or so I thought. I was tired of everyone saying, “Michael, no!” when I asked about Autism…so I wrote out three pages of notes for the “new” Psychologist who came to evaluate him, just before his third birthday. She finally said “Yes, Michael has Autism”….and added …” You should work for us, because you just wrote your own report.” (haha..Who knew?) She also saw him at Gymboree, and I think that helped me so much. While I do believe that I understood him well, I KNOW I could have understood him better if we went to the park, the grocery store, or day care with our early interventionist…and I regret deeply that I didn’t. It never occurred to me…it never occurred to my team. If they could have seen what happens with their own eyes and given me more tools…he would learn faster, and so would I. Coming from an outpatient/inpatient hospital setting, you better believe I was medical model all the way! Our family had SLP, CBRS, OT, IMH and ABA therapists involved. I was at the clinic and did in-home therapy. I hired a shadow for his private preschool. 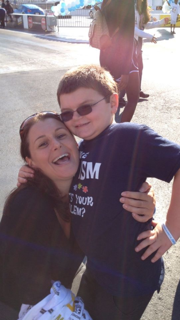 I educated myself and read everything I could on Autism, sensory integration, behavior…. And then it all stopped. I did not need a huge team anymore. I was armed. I got it. Life was therapy!!!!! (This is my motto by the way) So, I guess you could say, the result of my experience was that I did NOT need this big team of therapists that we amassed at two years old. Michael needed to be at school and in the real world. He needed exposure, and I always knew that. I endured the tantrums at Target for years after my EI experience. I am certain that he can go there now and think nothing of it because we kept going. We did not stay in the living room…which would have gotten him nowhere! Michael goes where I go. He is not perfect by any means, but he goes….because there was no way I was going to be the Gymboree mom who couldn’t bear to watch her kid behave badly in public or have an understanding of how to endure his behavior. The old days of doing therapy behind closed doors is stigmatizing for families and children. It isolates them and teaches parents very little. We need to be armed and equipped for a long future of challenges with our children. For children with a disability, the first therapists (and evaluators) in the door are almost never forgotten by parents. These therapists leave a lasting imprint on parents. These therapists have an opportunity that is invaluable. We need your help. We sometimes feel lost, and we need you to guide us. We may put on a brave face, but we are scared….and you are knowledgeable. I did receive coaching from my team when my family was enrolled in early intervention, but very little compared to our standards now. I see what is going on out there in the field now…and I wish I had more because I feel it would have made the first few years prior to kindergarten easier for Michael and me. But we didn’t know what we didn’t know then. And all was not lost, I learned a tremendous amount from my team, who all remain in my heart forever. Make no mistake, Michael has Moderate Autism. He is not a mainstreamed kiddo…He is 8 years old now and spends ½ of his day in the resource room, ¼ in general education, and ¼ in a self-contained classroom. He has worked through his self-injurious and aggressive behavior, but believe me, you could pick him out in public as the “odd” kiddo. He is sweet and mild-mannered now, but he has Autism and an Intellectual Disability as well (by one point, but who’s counting!!!). 8 Responses to Life is Therapy! Christine-love this! Thank you for such a great post. Michael is so lucky to have such a wonderful mom and we are so lucky to have you on our team! I absolutely love this!!!! You are so good at what you do, it amazes me!!! Thanks Shanel :)…and Sierra! I love what I do , so that is why! I miss you though! Thanks for sharing Christine! It always helps to hear from someone living it! Thank you for taking the time to read it Betsy! Hi Janis. I’m glad to hear you enjoyed it and found it important enough to share. I wish your friend well. Christine…This is so inspiring! I really appreciate your sharing and helping others learn from your experiences. You have really made an impact on the family we recently worked with together and I think it’s even greater than you may realize. Your ability to jump in where the family is and balance sharing information in an honest way with normalizing some of the overwhelming concerns for families is really amazing.